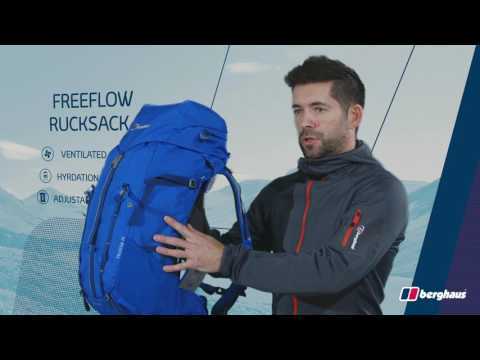 The Freeflow 35 rucksack keeps you cooler and more comfortable than ever, with a unique new back design that maximises airflow and comfort and reduces the build-up of heat and sweat. The innovative design ensures minimal contact between the pack and your back, allowing significantly more air to flow and keeping your back cooler than a close-fitting rucksack. So you stay cool and dry – free to enjoy your day without distraction. FINE-TUNED FIT Ill-fitting packs can rub and feel uncomfortable, but this pack’s range of adjustable features means your load feels way lighter. EXPANSION POCKETS Expansion side pockets mean there’s always room for those last minute essentials, so you can load up and head for the hills with everything you need on board. VENTILATED DESIGN Curved back design maximises air flow across the back, to keep you cool and reduce the build up of heat.